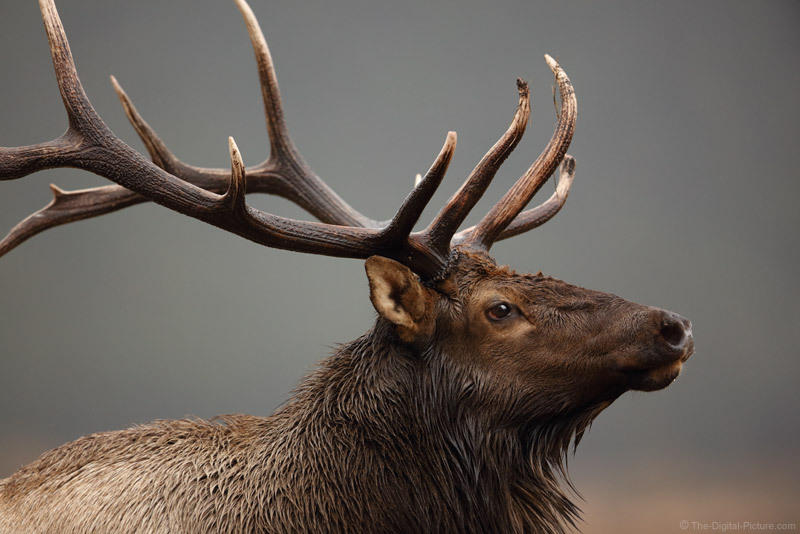 > Bull Elk in Rut – Was I Too Close? This bull elk was in full rut, was not in a good mood and he was looking for some cows to steal (could be a Charlie Daniels song). This is an un-cropped image captured with a 600mm lens on a full frame body and under many circumstances, I was waaaay too close. What you can't see in the frame is both a Rocky Mountain National Park ranger directing visitors and vehicles and my rental SUV between the bull and I. The meadow at Moraine Park is closed from late afternoon until morning and that means most photography opportunities in that location are then found alongside the road. That also means heavy competition for viewing positions when elk are present and finding a parking spot can be challenging at those times. A 4x4 vehicle with some clearance is helpful in accessing the more challenging parking opportunities (think rocks) and the rangers are also helpful, and especially helpful is preventing people from stopping in the middle of the small road, which of course still happens and creates long traffic jams. Increasing my safety were the people more "bold" (being nice here) than I. At the moment this picture was taken, this solitary bull was about to cross the road. The ranger parted the crowds and I took cover behind the SUV. Because the meadow is lower than the road, the bull had been lower than camera level. While good images can be made from a higher level, eye-level is often ideal and that height was reached as the bull approached the road. A catchlight in the eye adds life to an animal and that light usually comes from the sun and/or sky. There was no sun at this time (it was dark and rainy), but the more-upward angle helps to get a stronger sky reflection, lighting up the eye. I could not adjust my position and was using a prime lens. That meant this subject was going to be cropped in the frame. While I like having the entire subject in the frame, I also like tightly framed portraits. Full subject framing of wildlife is usually easier to accomplish and when tighter framing avails itself, especially with an animal like this one, I usually take advantage of that opportunity. When cropping a subject, there is often a variety of creative options. But, I most often want the eye in the frame. Keeping the head in the frame is often a next priority and ideally, giving the subject some space on the side of the frame being faced (the gaze weights that side of the frame). In this case, my next decision was determining how to adjust the vertical framing and more or less antler was the question. I find antlers very interesting and opted to go big on the antlers, smaller on the body. However, I left enough body showing to send the back line and a portion of the body out the left side of the frame and kept enough space below the chin to include the reverse-curving lines of the beard. In this case, the elk's head, the primary part of the animal, falls approximately on the intersection of the right and lower 1/3 grid lines. The photographic rule of thirds often works well for composition, but ... I more frequently first approach composition from inclusion/exclusion and balance perspectives. What I find is that the rule of thirds can frequently later be applied to my results. In general, the tighter the framing, the faster the shutter speed needs to be. For an image to be tack sharp, the exposure duration must be short enough that no details cross over to another pixel. It was dark out and I wanted to keep the ISO setting down. The 1/320 second exposure used here was a compromise and I tossed many images from this encounter due to motion blur. In the end, this was my favorite image from the series.